Good news! No, great news! 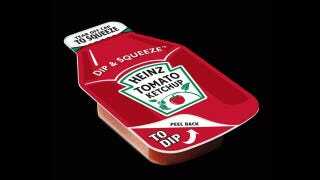 The Heinz Dip & Squeeze, a new single-serving ketchup package that promises to save us from the long national nightmare that has been the existing foil squeeze packet, is now rolling out to Chick-Fil-As nationwide. Ketchup! Liberated! The new package, which can be squeezed like the old ones or peeled back and dipped into, like, say, the Sweet and Sour sauce tubs at Burger King, will make on-the-go french fry eating significantly more enjoyable. To celebrate the occasion, Chik-Fil-A will give away free fries to customers who ask for the Dip & Squeeze between the hours of 2 and 4pm this Friday. Hopefully hopefully hopefully the Dip & Squeeze will be a runaway success, causing all other fast food joints to see the light and adopt it as well.